A huge outpouring of London History books this year, as ever. Here is a shortlist of our favourites. Lady Bette and the Murder of Mr Thynne by Nigel Pickford tells the story of an audacious drive-by assassination in the Haymarket in 1682. Scheming, intrigue, marriage- and power-broking in late-Stuart England. 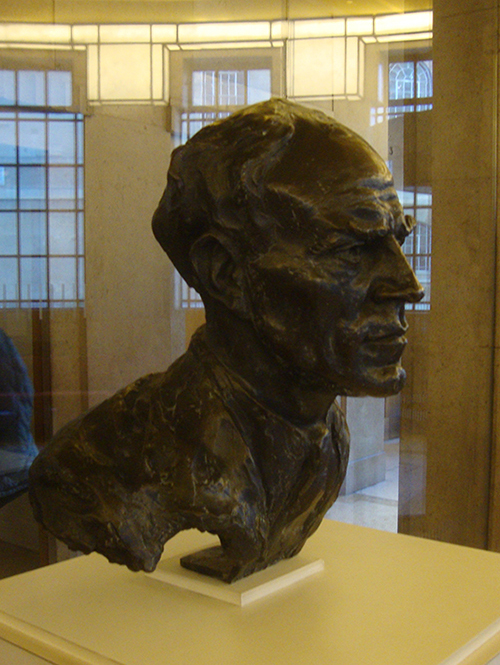 Men of Letters by Duncan Barrett tells of the exploits of the Post Office Rifles during World War One. Dirty Old London by Lee Jackson is all about squalor and filth among the living and even the dead in 19C London and how the Victorians attempted to combat a huge catalogue of blights, with only partial success. You will love all of these books, no question. 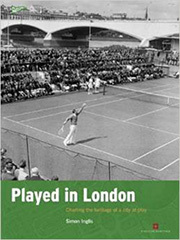 But our book of the year for 2014 is Played in London: charting the heritage of a city at play by Simon Inglis. Quite simply an exceptional work of social and architectural history. Deeply researched, superbly written, beautifully designed and printed with hundreds of photos, illustrations and maps. Our review. All our reviews for 2014. 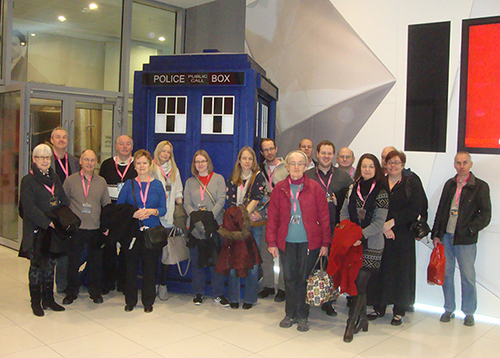 On Saturday a group of our Members enjoyed a guided tour of Broadcasting House. Roughly speaking the complex is horseshoe-shaped, comprising the original Portland stone art deco building we all know, which opened in 1932; the new eight storey wing next door which was added in 2006, and after his death named after the popular disk jockey John Peel; and the semicircular central structure which yokes the two wings together. The piazza in the middle is also an art installation which has world cities and significant sites written in paving slabs and arranged in what seems at first sight in random groups. It was nice to see a group comprising Damascus, Jerusalem, Constantinople. To the left is a Cafe Nero with no signage, in case BBC cameras unwittingly give the chain free advertising. BBC guides Jamie and Rich then gave us a superb guided mooch around this huge complex, touching much history. But first, from a gallery above, we observed BBC’s huge global news operation at work in what is probably the world’s biggest newsroom, certainly Europe’s. (without furnishing any evidence, China claims it has a bigger one). This is the backdrop you always see when watching live news on telly. The carpet of the part that’s on-air is red: no scratching, nose-picking, snogging etc. in this area, please. 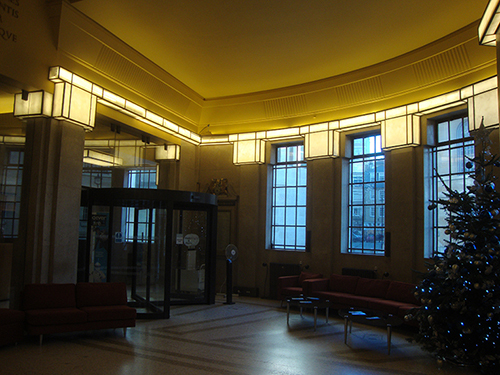 Mindful of who we were, our excellent guides dwelled on the historic parts of the old building: 1930s art deco glory of the reception area and the lifts (“once the fastest in London, now probably the slowest”); the original green room where now is displayed a – to be kind – rather strange tapestry given the BBC by the people of France in gratitude for wartime broadcasts; ancient microphones; the legendary BBC Radio Theatre, to this day constantly used. 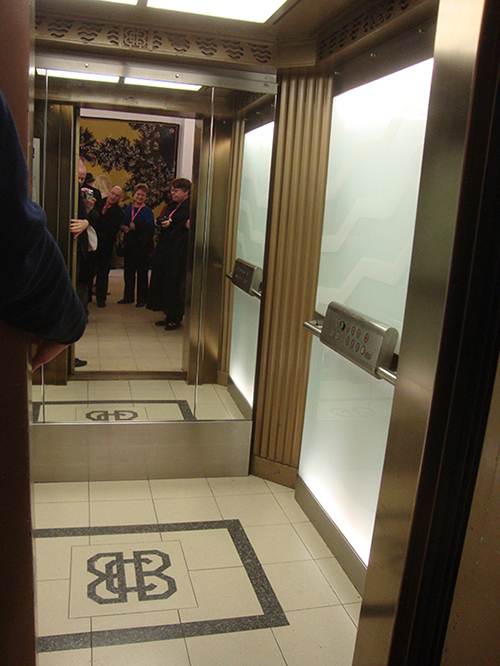 The art deco lift with ancient Beeb logo and 21C control panel. Tardis-like, in a way. Lord Reith, as in Reithian values. 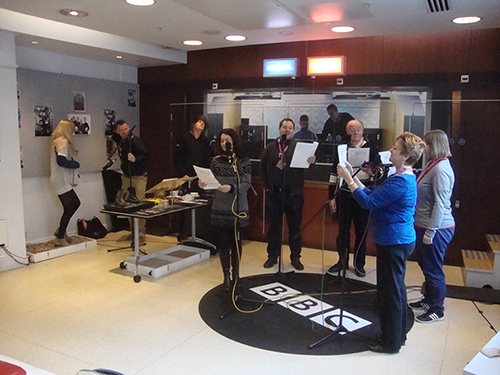 We finished our event in the studio where they record radio drama. Five London Historians volunteers took to the mics while another joined Rich in the sound effects department. Here’s a snippet of what we recorded. Not too bad at all: LH Member Steve would have put the shivers up Hitchcock himself. 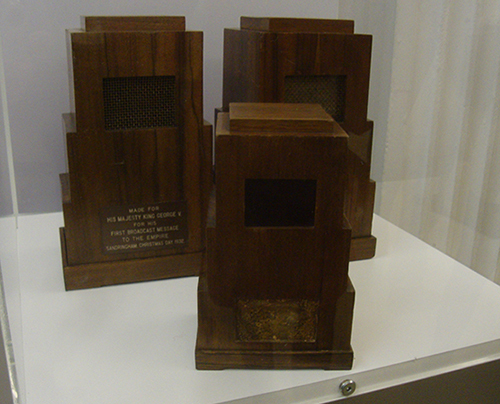 Radio drama. We took to it like ducks to water. 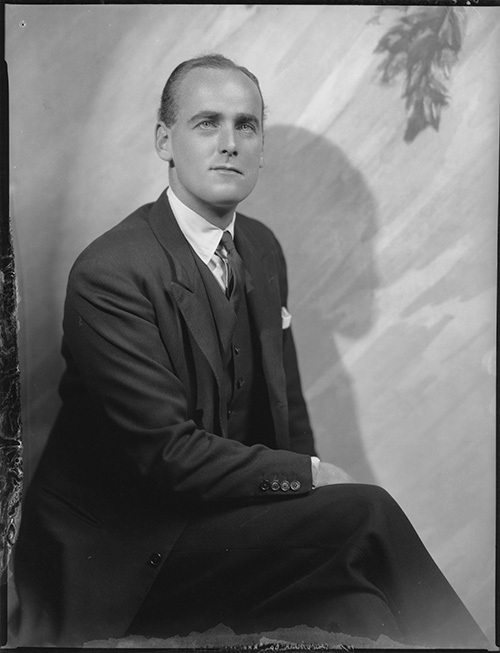 My favourite story of the day was about the actor and BBC announcer Bruce Belfrage. 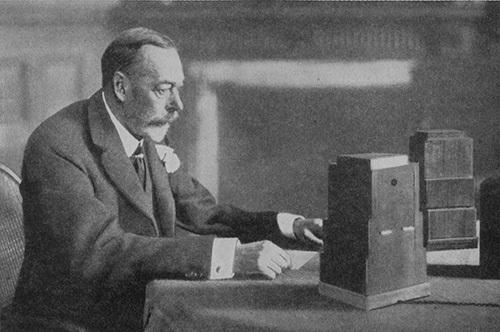 On the evening of 15 October 1940, this gentleman was reading the nine o’clock News, when a delayed time fuse bomb – which had penetrated the building some hours previously – exploded with great ferocity. Some ten seconds or so later after the rumbles had finally faded, Belfrage continued where he had left off without comment or fuss. In the National Portrait Gallery’s image below he is English sangfroid personified. After his shift he repaired straight to a local pub, the George. And after our tour, so did we. 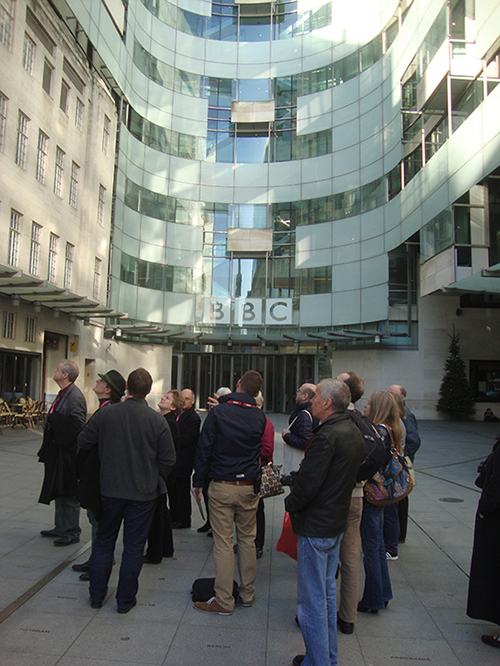 You can book a tour of Broadcasting House here. More photos from our outing on Flickr here.